Not your preferred language? This page is also available in Deustch, 中文, 日本語, 한국어. Join us live from Jeju! During the past year each of us have experienced God touching our hearts and aligning His heartbeat to ours. As each of us have encountered God individually, He has done the same in the global family. We have witnessed His sovereign hand doing miracles and healing our brokenness all over the world. As we have been pressing into what God has for this season, we sense that the Lord is calling His Body to come together and lift the name of Jesus with one heart, as one family, in Korea this March 2018. It will be an opportunity for us, with one voice, to intercede for those who have not yet experienced the unconditional love of God. The Gathering is an expression of family coming together. A response to His call, to assemble for His pleasure and delight. Join us in anticipation for what God would like to do in each of our hearts and that He would continue to establish His kingdom on earth, “ in Korea”, as it is in Heaven. We will gather for three days, we will seek His face together, as we allow the Holy Spirit to lead and direct us. Please pray and see if you are to join us at the Global Gathering in Jeju Island, Korea. Jeju Island is a Special Administrative Province of South Korea where no visas are required to enter the island. Only 11 countries are required to apply for a visa: Afghanistan, Cuba, Ghana, Iran, Iraq, Libya, Nigeria, Macedonia, Palestine, Sudan, and Syria. Please note that those travelling from China / India / Indonesia / Vietnam / Jordan connecting at Incheon or other cities in Korea must obtain a valid visa for legitimate entry into Korea. If you are arriving directly on Jeju Island from transfer airports outside of Korea, no visa is required. Please click here to check transfer airports with direct connections to Jeju Island. * Please note that Jeju is an island, visitors can only arrive by air. 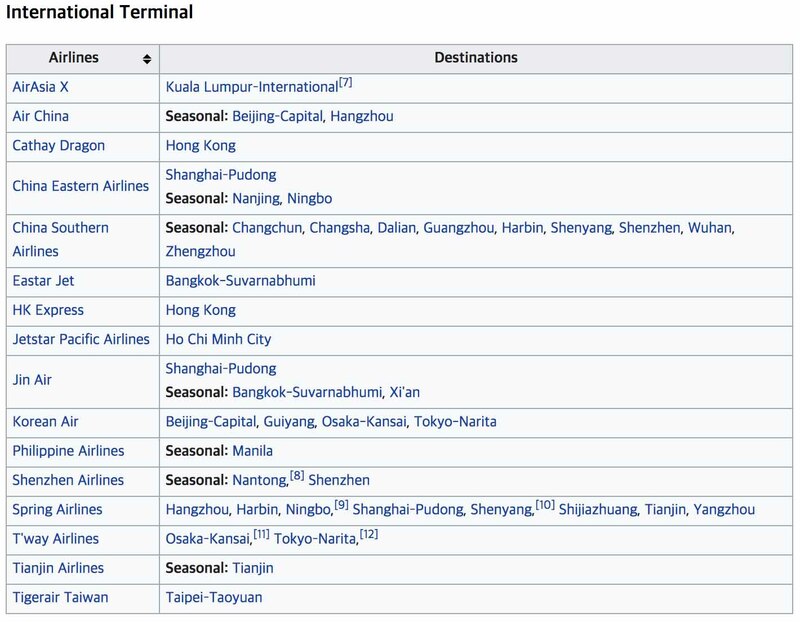 For those taking low-cost airlines (LCC), please click here to find out which domestic airlines fly direct to Jeju Island. For those arriving at Incheon Airport (ICN), please note that you will have to transit through Gimpo Airport (GMP) to reach Jeju Island. Please click here to find details on how to transit from ICN to GMP. A closed Pre-Gathering will take place on March 20 at 7:00PM. Please note that children 5 years old and older are required to register. There is no charge for children 5 and under. There are no restaurant facilities that can accommodate Gathering participants within 30 minutes of the International Conference Center. Additionally, the ICC does not permit outside food in the facility. Meal packages will not be available for purchase on-site. Breakfast included. Shuttle bus will cost $10 per person for 3 days. 1 minute walking distance to venue (International Convention Center Jeju). Breakfast not included. ($24 USD per person if pre-booked. From these hotels, you may join our shuttle buses or take the local bus #600 to the venue. There are no restaurant facilities that can accommodate Gathering participants within 30 minutes of the International Conference Center. Additionally, the ICC does not permit outside food in the facility. As we will not be returning to the hotel during the day, 5 meals are being included in the Gathering registration fee. There is a convenience store at the ICC that sells water and snacks. The Airport Limousine Bus No. 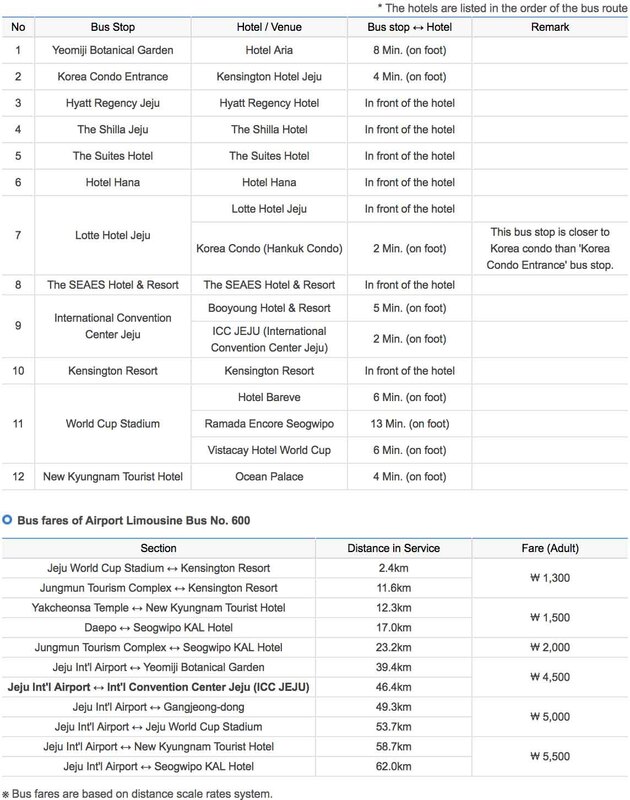 600 passes most hotels from Jeju International Airport. 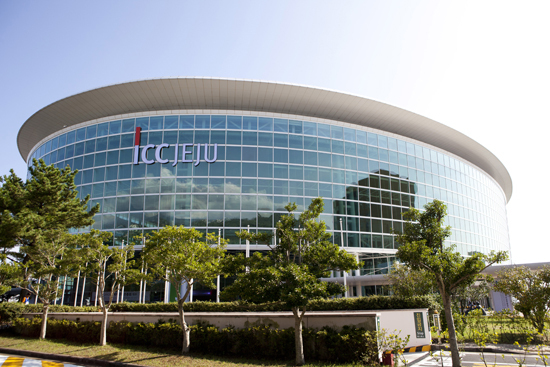 The bus is available to come and go between the ICC JEJU and the hotel on both routes and operates at 15-minute intervals. Bus fares are based on distance. In order to find the nearest bus stop from your booked hotel, please refer to the image above. For detailed information on distance from bus stop to the hotel and fares, please click here. Bus time table from Jeju Airport – Convention Center, please click here. 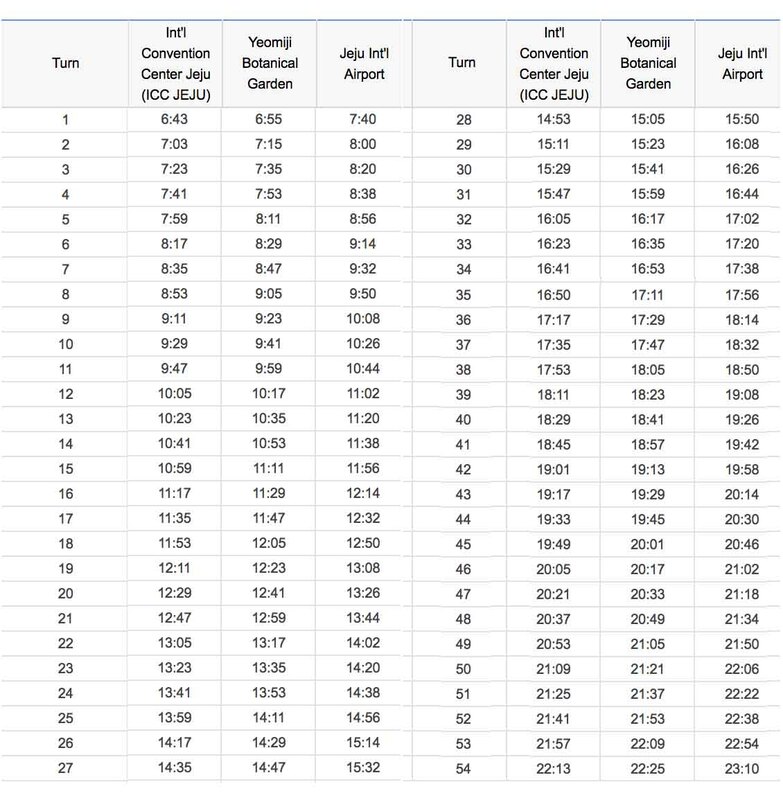 Bus time table from Convention Center – Jeju Airport, please click here. Will translation be offered at the gathering? Korean and English will be spoken from the stage. We will be offering translation via headsets for Mandarin, Japanese, and German. For other languages: If someone in your group is able to translate, we can lend you a smaller translation system. Please get in touch with us via the Contact form at the end of the FAQ section. When will the last session end? We plan to end by 1:30PM on Friday, March 23. Please note that children over 5 years old are required to register. We are unable to include meals with on-site registrations. Can we "share" a registration between two (or more) people? As we use wristbands to identify registrants for the Gathering, they are unable to be shared between people. If the conference centre is not filled to capacity, we will continue to offer on-site registration for the duration of the Gathering. We are unable to provide meals for on-site registrations. While we encourage participants to be part of the whole Gathering, of course, situations arise that make that difficult or impossible. As such, if the conference centre is not filled to capacity, we plan to make passes available at $50 USD (per day) for March 21st and 22nd, and $20 USD for March 23rd. Please note that we are unable to provide meals for on-site registrations. Are children welcome at the Gathering? Of course! We welcome the whole family to the Gathering. We are not, however, able to have a particular program for children or youth. While children are welcome at the Gathering, we are not able to provide childcare. As such, children will need to remain with their parents. How far is my hotel from the venue? Google Maps is generally accurate, you may search according to the addresses provided. Which hotel should I stay at? Details on hotels are available in the Accommodations section. Does every hotel include shuttle service to the venue? No. We will only be providing shuttle service from/to Hana Hotel and Corea Condo. The buses leave before the morning session and return after the evening session. Google Maps is generally accurate, you may search according to the venue address provided. How do I get to my hotel from the airport? The Airport Limousine Bus #600 will go through all the hotels near the venue. Please refer to our Transportation section for more details. What is the voltage in Korea? In Korea, the standard voltage is 220v, similar to most European countries. Almost every hotel provides free Wi-Fi service for their customers. You may buy a SIM card at Incheon International Airport at the KT counter. Alternatively, you may prebook your SIM card online (not affiliated with Watchmen for the Nations or the Global Gathering) and collect it at Jeju airport. What is the country code in Korea? What is the currency of Korea? Which credit-cards can I use in Korea? You may use Master Card and/or Visa cards at any hotel, restaurant, and store in Korea. Please exchange money at the airport if cash is needed. Still have a question? Drop us a message. Thank you for your inquiry. Our admin team will be in touch with you shortly.